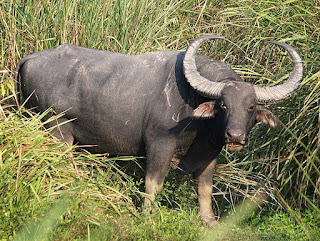 Wild Buffaloes are listed as one of the endangered species, wild water buffaloes in India are mostly concentrated in the state of Assam. 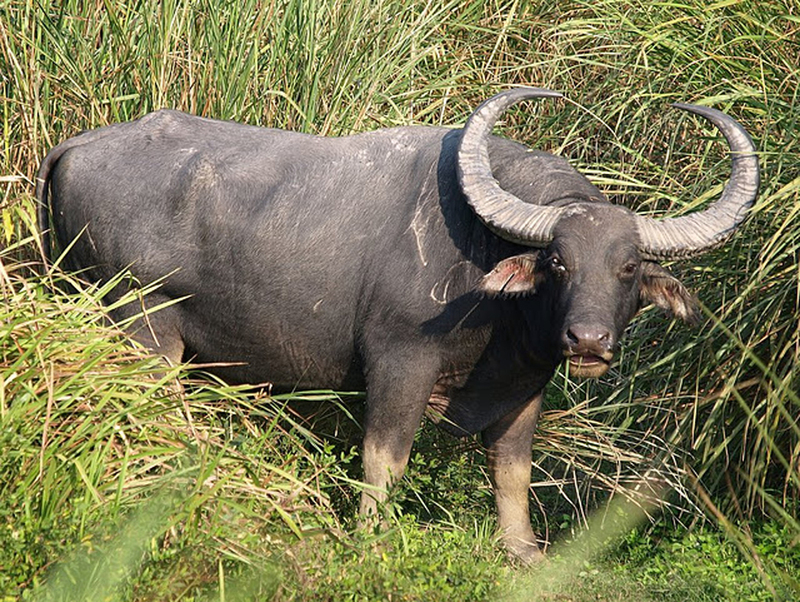 They are bigger than domestic buffaloes, with a narrow head, small ears and large hooves. These wild buffaloes have a tendency to form clans that are headed by older members. These clans have their specific areas for grazing, drinking and resting. 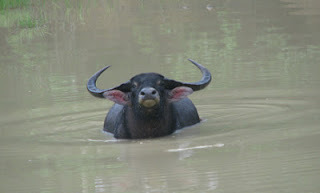 Wild water buffaloes live for about 25 years in their natural habitat, feeding mostly on grasses. To prevent these rare species from extinction, they have been kept under protection in wildlife reserves. These reserves or national parks offer a safe haven for them while providing favourable living conditions. Authorities of these wildlife sanctuaries have also taken necessary steps to make sure that these buffaloes are protected against diseases and natural calamities. Wildlife enthusiasts visiting these regions can watch these wild animals in significant numbers, roaming around in herds with members of their respective clans. 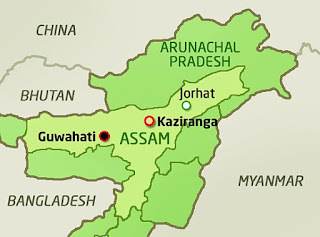 Kaziranga receives plenty of rainfall every year, which promotes the growth of grasses and other types of flora in this region. This abundance of natural vegetation provides nutrition for many animals of the region, including wild water buffaloes. An amazing plant and animal life of this wildlife reserve attracts many tourists from different parts of the world every year. Most of them arrive here for spotting wild animals, while some are interested in birding. This national park can be visited between the months of November and April, when climate is very pleasant and suitable for tourism. Wildlife tours are conducted during this period for tourists that present an opportunity for them to watch their favourite animals and birds in action. One can find many hotels and resorts around Kaziranga that offer comfortable lodging facilities for tourists. Eco-tourists generally prefer Jungle Home Resorts that give utmost importance to conservation of environment and wildlife. Accommodation in such types of resorts offer a pleasant stay for all tourists and rooms in them are fully furnished with eco-friendly materials. Nature lovers would definitely appreciate marvellous views of natural surroundings from their rooms in these resorts. Some of these resorts are located very close to the national park which provides a great deal of convenience for tourists to visit this wildlife sanctuary. They provide all basic facilities for guests and there are certain added amenities for a pleasant stay. Guided tours are also available as a part of these amenities which enable guests to embark on sightseeing tours at their convenience. 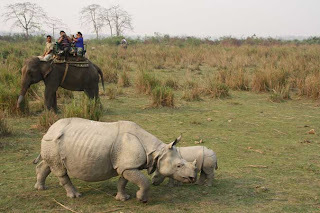 Wildlife safaris offered as a part of Kaziranga accommodation also helps them to watch different types of wild animals in this region, such as One Horn Rhinos, Hoolock Gibbons and Wild Water Buffaloes. But, before entering this national park, necessary permits have to be taken. Authorities have certain rules in place to make sure that no disturbance is caused to wildlife in this region and a pollution-free environment is maintained. Services of trained nature guides who accompany tourists during such wildlife tours serve the purpose of ensuring that park rules are strictly followed. Rhinoceroses are herbivorous animals, having a thick skin on their body and large in size. Popularly known as 'rhinos', these animals are found mostly in African and South-Asian countries. A one horned rhino can be found in India owing to brilliant conservation measures undertaken by authorities. These animals have very sharp hearing capability and a strong sense of smell, by which they can easily find their companions. They go around searching for food when the environment is a bit cooler to avoid heat of the afternoons. Whenever there is a rise in temperature, they lie submerged in water to avoid exposure to extreme heat. In the past few years, many rhinoceroses have been killed for their horn and other parts that have a high demand in certain countries. In order to prevent their extinction, many of their existing population have been moved to wildlife reserves where they enjoy a safe habitat. Kaziranga is a place in India where nearly two-thirds of world’s rhinoceroses reside. Their conservation work was pioneered by Mary Victoria Leiter Curzon, also known as Lady Curzon, who visited this region in the year 1904. It is now a UNESCO World Heritage Site which has been highly successful in conserving the animal. This protected area has become an integral part of Assam tourism in recent times, as it gets large number of visitors every year. 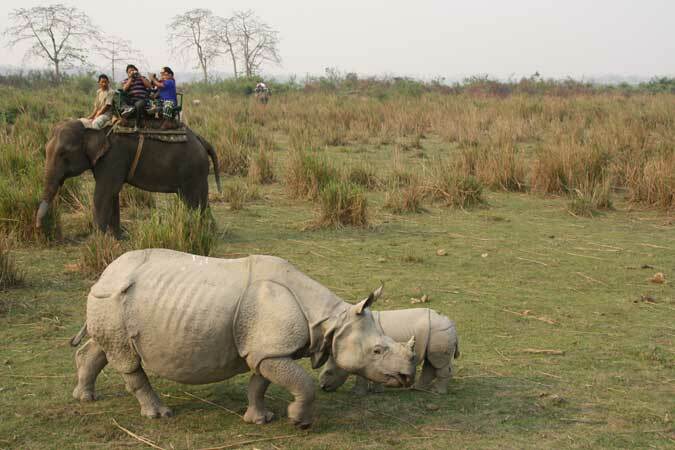 Rhinos have an ideal environment in Kaziranga, where there are vast expanses of grasslands and water bodies. Wildlife safaris are conducted during tourist seasons to help visitors in watching these animals closely. These safaris or guided tours are conducted with the help of jeeps or elephants. Several restrictions have been placed to protect this wildlife reserve from getting polluted or causing any kind of disturbance to its wild animals. Many tourists extend their support in several ways for improving conservation process and creating more employment opportunities. Due to such activities, population of rhinos has increased to a considerable extent over the years. What attracts visitors most is the sight of rhinos that can be found in several areas of this wildlife sanctuary. Attempts have been made to improve travel and tourism in this region by increasing facilities offered for tourists. As a result, visitors to Kaziranga National Park can find great places for having a comfortable stay during their tour of this wildlife sanctuary and its surrounding regions. There are several choices in hotels and resorts around Kaziranga, where well-furnished rooms are available at reasonable rates. These rooms are fully equipped with all basic facilities and also include modern amenities to ensure a luxurious stay for tourists. Some of the resorts also organize guided tours to Kaziranga for their guests at convenient timings. These tours or safaris can enable them to sight their favourite Indian rhinoceroses and other wild animals moving around freely in the region. For those who are longing for some delicious cuisines during their tour, some of these resorts or hotels have multi-cuisine restaurants that include popular dishes as well as some local delicacies. Kaziranga National Park is the oldest wildlife reserve in Assam, covering a vast area and consisting of numerous species of plants, animals and birds. This national park has achieved great success in conserving several endangered species of animals such as one-horned rhinoceros and wild water buffalo. Visitors to these parks can watch these wild animals and birds closely with the help of wildlife safaris that are conducted regularly during tourist seasons. Kaziranga National Park gets plenty of tourists every year, who come from different corners of this world to sight the amazing wildlife of this region. Many of them love to see endangered species during their wildlife safaris. Many hotels and resorts around this region offer these tours as a part of their added amenities. Best time to visit Kaziranga National Park is between the months of October and April, when its climate is pleasant and favourable for conducting sightseeing tours. It is during this period that most of the animals can be seen having a nice time in the wild. Wildlife tours in this region are conducted either on elephants or in Jeeps. Elephant Safaris begin early in the morning and are extremely helpful in exploring different types of wild animals. They place tourists in an appropriate position so that their view is not obstructed by tall elephant grass by which this wildlife reserve is covered. Generally, a wakeup call is given about half an hour before the elephant ride commences. Individuals who are eager to explore the jungle with a Jeep Safari in Kaziranga can cover longer distances within a short period of time. These tours are accompanied by trained nature guides or escorts and take three to four hours. These wildlife tours are carried out without causing any disturbance to wildlife in the national park. There are specific routes on which the jeeps are run, maintaining the right distance between animals and humans. For any of such tours, permission from authorities is absolutely essential. Due to this reason, tourists obtain necessary permits before entering this wildlife sanctuary. Drivers of jeeps are required to stick to the trails that have been designed to avoid contact between animals and visitors. It is necessary to observe certain rules that ensure a safe and enjoyable tour for visitors during jungle safaris. Tourists who book accommodations in Jungle Lodge and Resorts must be well aware of them. Drivers are required to drive slowly during jeep safaris to avoid causing any disturbance to animals. Playing of car stereos or transistors is strictly prohibited, as animals would easily get distracted with such sounds. Wearing of less bright clothes would also go a long way in preventing animals from getting distracted. Tourists must be careful not to light any campfires as they can scare most of the animals. Authorities have taken great efforts in maintaining a pollution-free environment in this region. Due to this reason, visitors are required to dispose off any garbage into bags that are provided. Taking photos is something that tourists can enjoy without any restrictions and they can take away unlimited memories with them. India's north-eastern forests have many species of wild animals that have been provided adequate protection by authorities. Best example is the region of Kaziranga National Park, where Hoolock Gibbons can be seen jumping around from one branch of a tree to another is Kaziranga travel attraction. These are India's only apes and are classified into two kinds, western and eastern. They rarely step on ground as most of them can be seen swinging from one tree to another at amazing speeds. Males have black hair and have a white brow, while females have copper-tan hair which is dark-brown on the sides of their faces. Kaziranga's forests supply them with all their diet requirements consisting of fruits, leaves, flowers and shoots. These apes are famous for their peculiar voices that can be heard from longer distances. They make such sounds to attract their mates and each call echoes across trees, making their presence felt in this region. Monsoons in Kaziranga provide enough rains for this wildlife reserve, which satisfies the requirements of its flora and fauna. Winters are highly pleasant in this region, but summers are dry and not very comfortable for tourists. Best season to visit this national park would be between the months of October and April. This is a perfect time to embark on wildlife safaris or go birding around Kaziranga to sight its marvellous animals and birds. These tours can help visitors to have an excellent view of their favourite animals or birds in action. 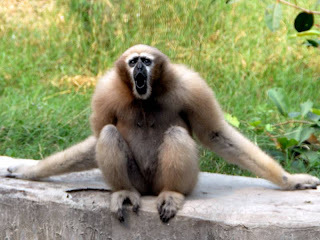 Hoolock Gibbons can also be sighted during these trips. In addition to these safaris that are conducted on jeeps or elephants rides, there are observation towers situated at strategic points for getting a better view of wildlife in this region. Visitors are free to take as many photos as they want with their cameras, but there are certain rules to be followed during their Kaziranga wildlife safaris. Authorities have taken great efforts to maintain a tranquil environment for its animals and birds. Due to this reason, visitors are expected to maintain the required distance from wild animals and not to do something that disturbs animals in the wildlife reserve. Tourists visiting Kaziranga National Park for making their holidays or vacations memorable can choose to stay in any of the Kaziranga resorts or hotels. Some of them are located very close to the wildlife reserve and offer beautiful views of lush green landscapes. A Kaziranga accommodation would give tourists the chance to stay in the midst of natural surroundings and enjoy wildlife tours for sighting their favourite Hoolocks Gibbons at convenient timings. Some of the resorts in this region encourage eco-tourism in a bid to promote a greener environment and conserve wildlife. Rooms or cottages in such hotels or resorts are fully furnished with eco-friendly materials and have all basic amenities that would ensure a comfortable accommodation for their guests. But there are certain added amenities available for guests which would make for a luxurious stay, such as, airport pick-up and drop facility, currency exchange and travel desk assistance.